Scene from The Nutcracker, popularized in the United States by Balanchine. George Balanchine (January 22, 1904 — April 30, 1983) was one of the twentieth century's foremost choreographers and one of the founders of American ballet. His work formed a bridge between classical and modern ballet. Born in St. Petersburg and schooled in the Russian classical tradition, Balanchine defected to the West in 1924 when the opportunity arose to join Serge Diaghilev's renowned Ballets Russes in London, England. There he continued a choreographic career that would take him to the world's great companies, and finally to America where he founded the celebrated New York City Ballet. His United States staging of The Nutcracker made that ballet a part of the American Christmas tradition. Although Balanchine's works often carried Western themes, they were always staged in the distinctive Russian idiom that stressed the dancer's self-discipline over any excesses of athleticism. The choreographer reached uniquely celebrated status not only due to his innovative prowess combining Western and Russian styles, but because of the dance-public's appreciation of the acclaimed Russian dance tradition, itself. During the Cold War, Balanchine's dance works connected the two adversarial cultures. When he died in 1983, Balanchine had choreographed for 15 companies around the world, and had a portfolio containing some 115 distinctive works. The Imperial Ballet's production of Sleeping Beauty shows the rich costuming tradition which Balachine later brought to the West. Balanchine was born Georgi Melitonovich Balanchivadze in Saint Petersburg, Russia. His father, noted Georgian composer Meliton Balanchivadze (1862 — 1937), was one of the founders of the Georgian Opera. Balanchine's brother, Andrei Balanchivadze (1906 — 1992), also went on to become a well-known Georgian composer. In 1913 at the age of nine, Balanchine enrolled in the Imperial Ballet School, principal school of the Imperial Ballet, where he studied under Pavel Gerdt and Samuil Andrianov. 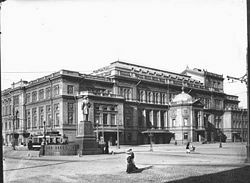 With the victory of the Bolsheviks in the revolution, the school was disbanded as an offensive symbol of the Tsarist regime. To survive the privation and martial law of this period, Balanchine played the piano—in exchange for food, not for money—at cabarets and silent-movie theaters. The Petrograd Conservatory, where Balanchine studied. Eventually the Imperial Ballet School reopened, but with greatly reduced funding. After graduating with honors in 1921, Balanchine enrolled in the Petrograd Conservatory in tandem with his corps de ballet duties at the State Academic Theater for Opera and Ballet. In 1922, when Balanchine was eighteen, he married Tamara Geva, a 15-year-old dancer. His studies at the conservatory included advanced piano, music theory, counterpoint, harmony, and composition. Balanchine graduated from the conservatory in 1923, where he was a member of the corps until 1924. While still in his teens, Balanchine choreographed his first work, a pas de deux called La Nuit (1920, with music by Anton Rubinstein). This was followed by another duet, Enigma, danced in bare feet. In 1923, with fellow dancers, he formed a small ensemble, the Young Ballet. The choreography proved too experimental for the new authorities, who strongly encouraged the group to disband. Balanchine—along with fellow dancers Tamara Geva, Alexandra Danilova, and Nicholas Efimov—was granted permission to tour Western Europe in 1924. 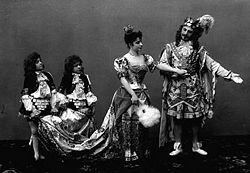 While they were performing in London, ballet impresario Sergei Diaghilev asked the group to join his Ballets Russes, prompting the four to defect. Alexandra Danilova, Balanchine's common law wife during his Ballet Russes years. Diaghilev soon promoted Balanchine to become the ballet master of the company, and allowed him to develop his own choreography. Between 1924 and Diaghilev's death in 1929, Balanchine created nine ballets, as well as several smaller choreographies. Unfortunately, he also suffered a serious knee injury at this time, which limited his dancing and effectively ended his performance career. In 1926, Balanchine and Tamara Geva divorced. Balanchine married and divorced three more times. All were dancers—Vera Zorina (December 1938 — 1946), Maria Tallchief (1946 — 1952), and Tanaquil LeClerq (1952 — 1969), as well as his common law wife, Alexandra Danilova (1926 — 1933). He had no children. After Diaghilev's death, the Ballets Russes fell into disarray. Balanchine began to stage dances for the Cochran Revues in London, and was retained by the Royal Danish Ballet in Copenhagen as guest ballet master. He returned to the Ballets Russes when it settled in Monte Carlo, resuming his post as ballet master for the new Ballets Russes de Monte Carlo, and choreographed three ballets—Cotillion, La Concurrence, and Le Bourgeois Gentilhomme. His muse in Monte Carlo was the young Tamara Toumanova, one of the original "Baby Ballerinas." When René Blum passed control of the company to Colonel W. de Basil, Balanchine again left the Ballets Russes. This time he formed his own company, Les Ballets 1933, with the financial backing of Edward James and Diaghilev's former secretary and companion Boris Kochno as an adviser. The company lasted for only a few months in 1933, but in that short time several new choreographies were conceived by Balanchine, including artistic collaborations with Bertolt Brecht, Kurt Weill, Pavel Tchelitchew, Darius Milhaud, and Henri Sauget. After a performance by Les Ballets 1933, Lincoln Kirstein, an American arts patron with a dream of establishing a ballet company in the U.S., met Balanchine and quickly persuaded him to move to the United States. By October of that year, Balanchine had crossed the Atlantic for the first time and launched his influence on the character of American dance. Upon arriving in the United States, Balanchine insisted that his first project would be to establish a ballet school, and with the support of Lincoln Kirstein and Edward M.M. Warburg, the School of American Ballet opened its doors to students on January 2, 1934, less than three months after Balanchine arrived in the U.S. The students premiered Serenade at the Warburg's summer estate later that year. During the 1930s and 1940s, in addition to his ballet activities, Balanchine worked as a choreographer for musical theater with such notables as Richard Rodgers, Lorenz Hart, and Vernon Duke. In 1935, the American Ballet was formed as a professional company in New York. The company began performing at the Metropolitan Opera House but staged only two performances—Orfeo and Eurydice in 1936 and an evening of dance choreographed to the music of Igor Stravinsky in 1937. Balanchine moved the company to Hollywood in 1938. It reconvened as the American Ballet Caravan and toured North and South America. However, it too folded after several years. 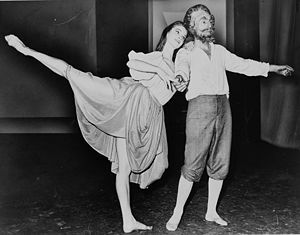 Balanchine and Suzanne Farrell in Don Quixote. Balanchine served as resident choreographer for the Ballet Russe de Monte Carlo from 1944 to 1946. He then formed a new dance company—eventually known as the New York City Ballet(NYCB)—again with the help of Lincoln Kirstein. After several successful performances, the company was offered the opportunity to work at New York City Center for Music and Drama as its resident company in 1948. Balanchine's 1954 staging of The Nutcracker, performed every year in New York City during the Christmas season, is largely responsible for making the ballet a Christmas tradition in the United States. In the 1960s, Balanchine fell deeply in love with the young and talented Suzanne Farrell. He created many ballets for her, including Don Quixote (with him playing the Don, and Farrell, Dulcinea), and the Diamonds section of the full-length ballet Jewels. The romance suffered however, because Balanchine was still married to Tanaquil LeClerq, and Farrell, a Roman Catholic, refused to consummate the romance. 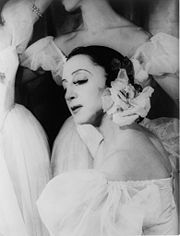 Farrell's position in the company was the cause of consternation—some ballerinas, like his former wife, Maria Tallchief, quit, citing Farrell as the reason. Balanchine obtained a Mexican divorce from LeClerq, only to discover Farrell had married a fellow company dancer, Paul Meija. Balanchine and Farrell became increasingly estranged, and in 1970 both Farrell and her husband quit the company. They then moved to Brussels and joined Maurice Bejart's dance company. In 1975, Farrell returned to the NYCB. George Balanchine received the Kennedy Center Honors Award in 1978, the first year the awards were given. In 1983, Balanchine died of Creutzfeldt-Jakob disease, diagnosed only after his death. He first showed symptoms in 1978 when he began losing his balance while dancing. As the disease progressed his equilibrium, eyesight, and hearing deteriorated. By 1982 he was incapacitated, and he died the following year at the age of 79. Divertimento from "Le Baiser de la Fée"
Choral Variations on Bach's "Vom Himmel Hoch"
All links retrieved June 13, 2017. This page was last modified on 13 June 2017, at 21:32.